Below is an alphabetical list of Campgrounds in Alaska including RV Parks and public camping areas. On the following page is a regional list of campgrounds and RV parks in Alaska. 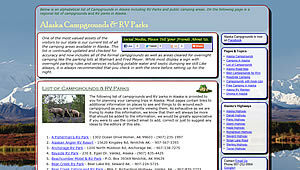 List of Alaska Campgrounds an RV Parks. One of the most valued assets of the visitors to our state is our current list of all the camping areas available in Alaska. This list is continually updated and checked for accuracy and now includes all of the formal campgrounds as well as areas cleared for overnight camping like the parking lots at Walmart and Fred Meyer. While most display a sign with overnight parking rules and services including potable water and septic dumping we still Like always, it is always recommended that you check in with the store before setting up for the night. The following list of campgrounds and RV parks in Alaska is provided to you for planning your camping trips in Alaska. Most pages contain links to additional information on places to see and things to do around each campground as you are currently viewing them. As exhaustive as we are trying to make this information, we know that their will always be more that should be added to the information, we would be greatly appreciative if you were to use the contact email to add, correct or just to suggest any ideas to the editors of this site. Share this list of campgrounds with friends. We hope you found this all inclusive list of campgrounds in Alaska helpful and complete. If you know of any new campgrounds in Alaska that are not on the list, please contact us so we can include them in future updates. Enjoy this free list of Campgrounds in Alaska updated with current information for planning a camping trip in Alaska.